Win A Sparkling Overnight Treat for Two in Brighton! 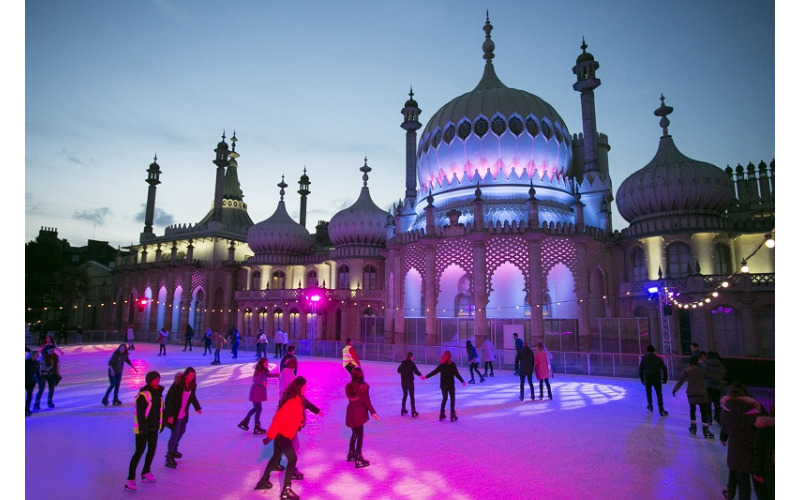 Win a romantic winter treat for two in Brighton, including skating, hot drinks and dinner at the twinkling Royal Pavilion Ice Rink and an overnight stay with breakfast and cocktails at My Brighton – a funky, boutique hotel in the heart of Brighton’s best restaurants and attractions. For those looking to just sit back and soak up the festive atmosphere, visitors can spectate from the cosy rink-side Bar & Kitchen or on its 40-metre terrace next to the ice. With plenty of space for larger gatherings, the 130-seater restaurant offers sumptuous snacks, hearty meals, including stone baked pizzas, a fantastic after school menu for kids and a great bar selection including local ale and a range of craft beers, 14 different gins, and mulled wine or cider. The ice rink is open November 3rd to January 13th. Skate tickets cost from £10 for adults and from £7 for children under 12. After all that Regency fun, the winner will enjoy bed and breakfast in a double room at hotel, My Brighton: a spirited place that fuses artisan tastes with soul and progressive design. Created in 2008 as a bolthole for business, pleasure and hedonism – its design is a reflection of a collaboration between the city’s own local creatives and New York-based, award winning designer Karim Rashid. Entering the hotel you’ll be transported to a place where Freddie Mercury might have met the Maharishi. The lobby features huge crystals and hand crafted furniture, set against organic curves and Karim Rashid’s own signature shapes, such as the figure of eight shaped cavernous cocktail bar – Merkaba. During your stay you will enjoy a taste sensation in our award winning cocktail bar, where the staff are always ready to welcome you with a smile and something out of the ordinary. The 79 guestrooms are spread over three floors, each featuring fluid organic curves woven into the architecture of the building, with many rooms offering floor to ceiling windows and an inset double-ended chaise-longue. Bright colours blend boldly with contemporary and futuristic design ideals to create a weekday affair far from the ordinary. The prize: Win A Sparkling Overnight Treat for Two in Brighton!